The Himalayan Salt Stone Massage had a lovely light heat, more warming than what you might think of with a Hot Stone massage. This process can sometimes increase blood circulation and reduce inflammation. I certainly felt better afterwards! I did not realize how tweaky my back was until after the massage began. The therapeutic massage did wonders for my partner. He left the table feeling stretched, relaxed, and ready to go home and cuddle! Be prepared to have something already cooked at home or to get some food, because all you are going to want to do after is curl up and enjoy the post massage bliss. Elements Massage in Irvine is a beautiful location. Definitely a perfect place to stop and relax. 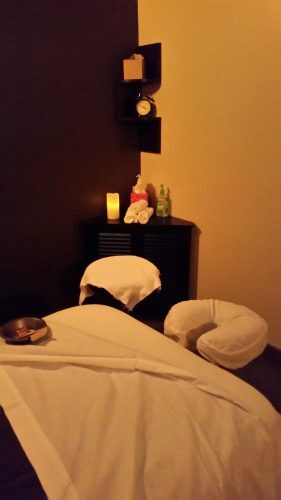 You can find an Elements Massage near you on their website Elementsmassage.com A couples massage is a wonderful treat for both of you to enjoy together.